Shawl knitted with merino wool. 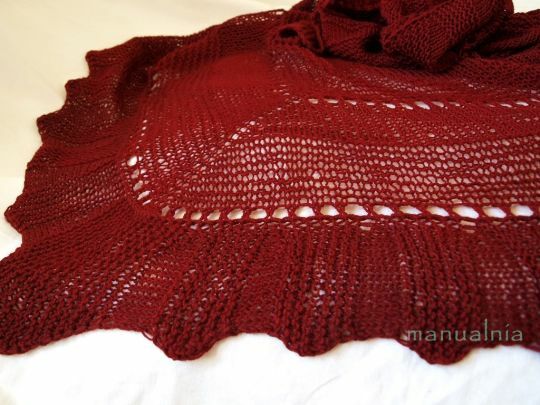 I had 3 balls of it but one was a diferent shade of red – I needed to dye whole shawl. I used Jacquard’s Acid dye in fire red color. Shawls is really big, huge…. 220cm x 92cm (86in x 36in), you can wrap your body like a mummy! Shawl needs about 800m of yarn, needles 3,75mm. Wow that is huge! Beautiful!